Call it what you will, an obsession, a passion, or an unexplainable affliction, but I LOVE Jeep Wagoneers. 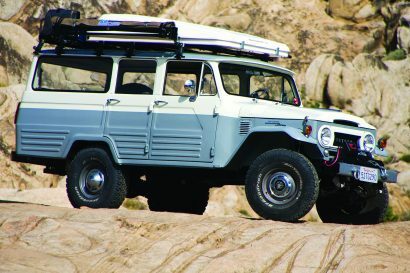 There’s something so classic about them that I can’t help but want to purchase one, park it in front of a cabin in the woods, and then take it fly fishing. 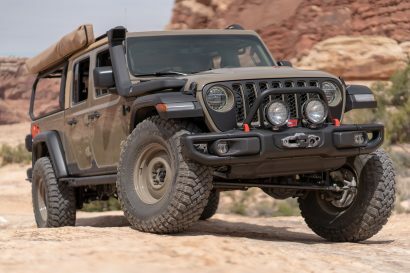 The only trouble is that I need a capable four-wheel drive, and while they are great for family excursions, they’re not exactly rock crawlers. That is, unless you’re talking about the one built by ROAMR. We spotted this build last year and immediately fell in love, and now it seems that it has finally come up for sale, so let’s take a look. 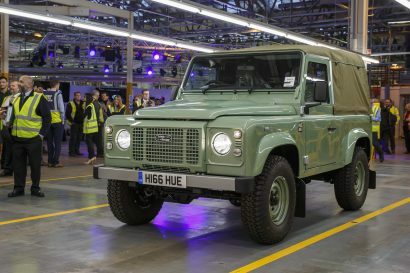 Those of you familiar with these trucks are probably thinking that the year doesn’t match some of the styling cues, and you’d be right. 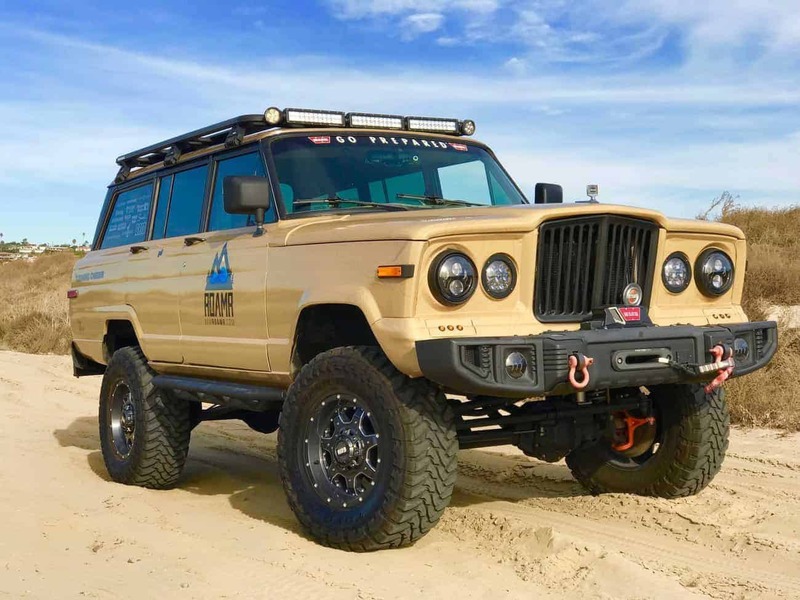 The grill, which was swapped from a 1965 Gladiator, is about the only part on the vehicle that makes it look more retro, while everything else brings this full-size Jeep into the world of modern four-wheel drives. Let’s start with the obvious. 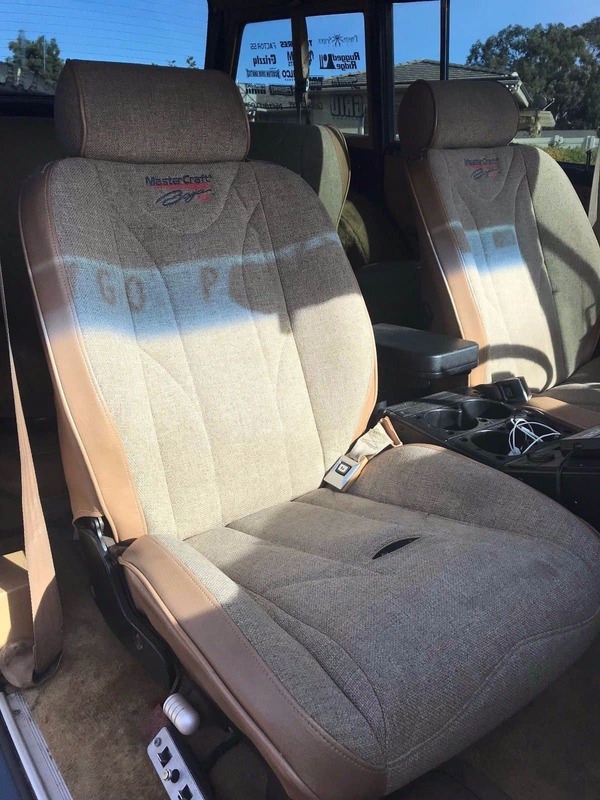 The entire Wagoneer has been covered in a durable tan wrap, and the trim has been painted to match for a seamless finish. 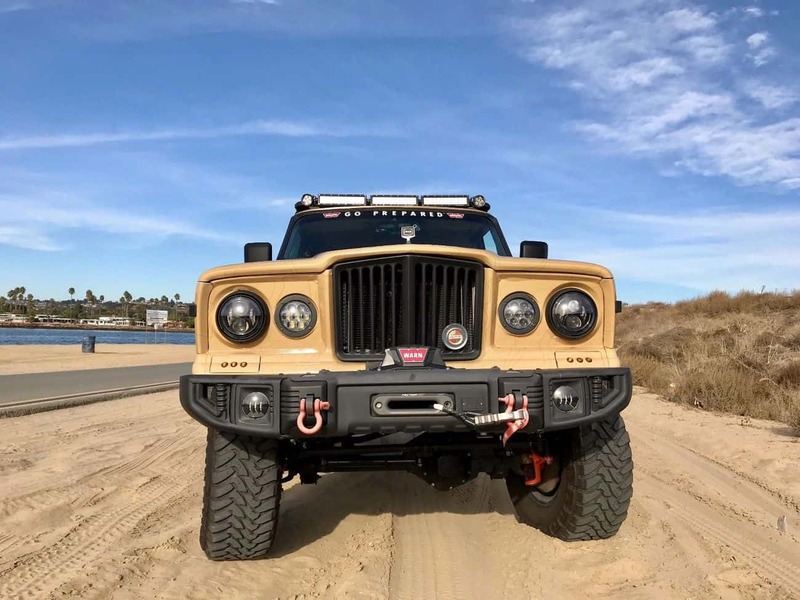 The bumpers are custom fit Spartacus models from Rugged Ridge, and each sports a set of aftermarket LED lights, while the front bumper houses a Warn 12,000-pound winch with wireless controller, synthetic rope, and a Factor 55 Ultrahook. The headlights and driving lights have also been updated to JW LEDs for improved visibility, and they do a tremendous amount to change the overall look. On the roof, a low-profile Rhino-Rack Pioneer platform is ready to haul bikes, kayaks, and anything else you need on your next adventure, while a Rugged Ridge Spartacus light bar illuminates the path ahead. (What SEMA build doesn’t have an LED light bar?) 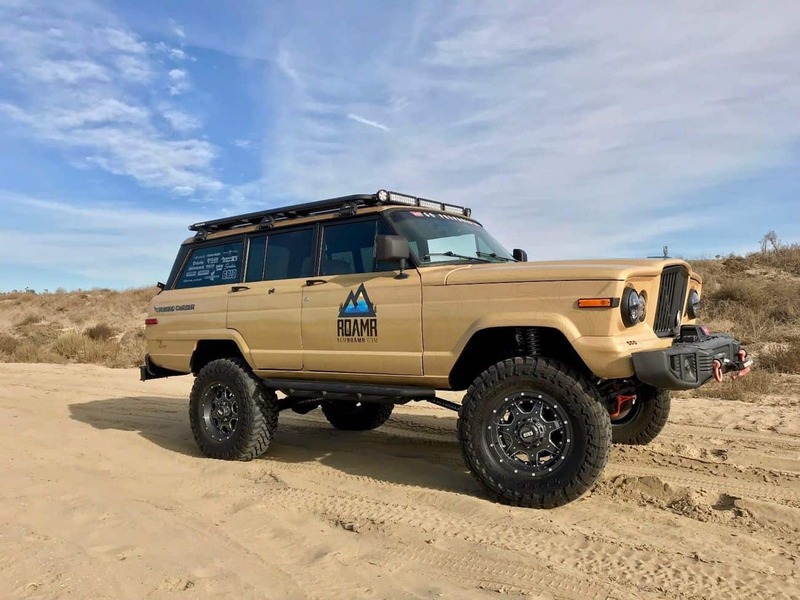 Since this Wagoneer is a full-size Jeep and intended for off-road use, IAMROAMR added a set of Spartacus sliders to protect the vehicle’s rocker panels. Then there’s the suspension, and that’s where things get really interesting. Let’s just say this isn’t your grandfather’s Wagoneer. The suspension is a completely custom and functional 4-link setup, designed and built by Castle Fabrication in Laguna. 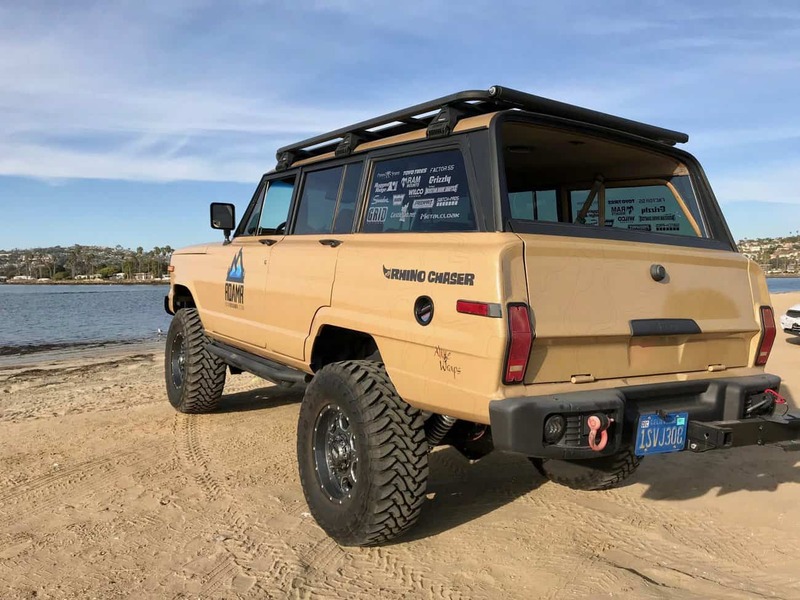 It was created using Metal Cloak builder components resulting in a 4-link front and rear with Y-link front arms, track bars, and anti-sway bars. To give it a plush ride, Castle used FOX 12-inch coilovers with external reservoirs, and Teraflex SpeedBumps bump stops in both the front and rear. 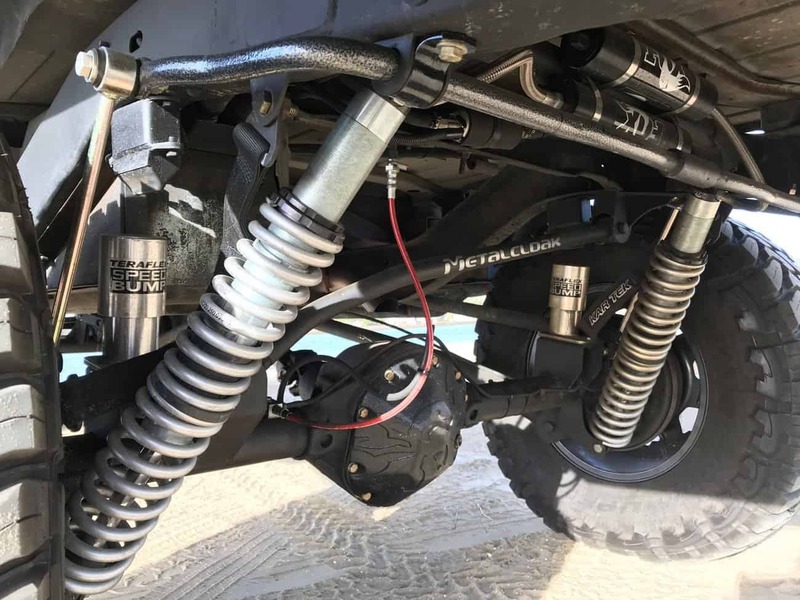 This whole packaged allowed for the fitment of 17-inch Grid OffRoad GD-1 wheels with 35-inch Toyo Open Country tires, which are controlled by Reid Racing Knuckles and Artec steering components with a Steering stabilizer to account for the increased loads. 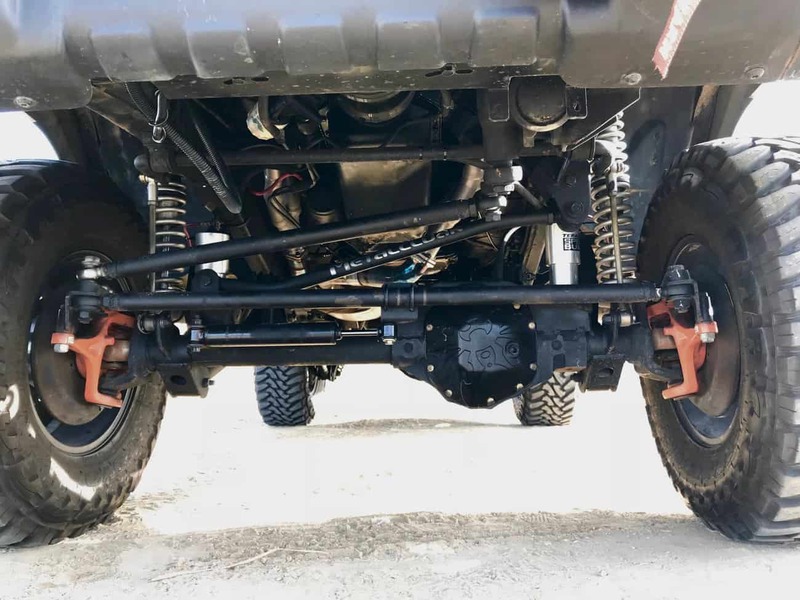 Although the Dana 44 axles are original, both the front and rear axles have been completely rebuilt with RCV chromoly axle shafts and brand new Warn Locking Hubs. Poison Spyder diff covers were added for additional protection on the trail, and it is running on 4.10 gears with Eaton Detroit Trutrac limited-slip differentials. As the finishing touches, IAMROAMR installed Tom Woods 1310 custom driveshafts with a new front axle truss. Inside the vehicle, buyers will find MasterCraft Safety Seats mounted on electric bases for adjustment, a RAM mount center console, and a Switch Pro 8 panel running all lights and accessories. There’s even a bluetooth stereo with hands-free features for talking on the go. 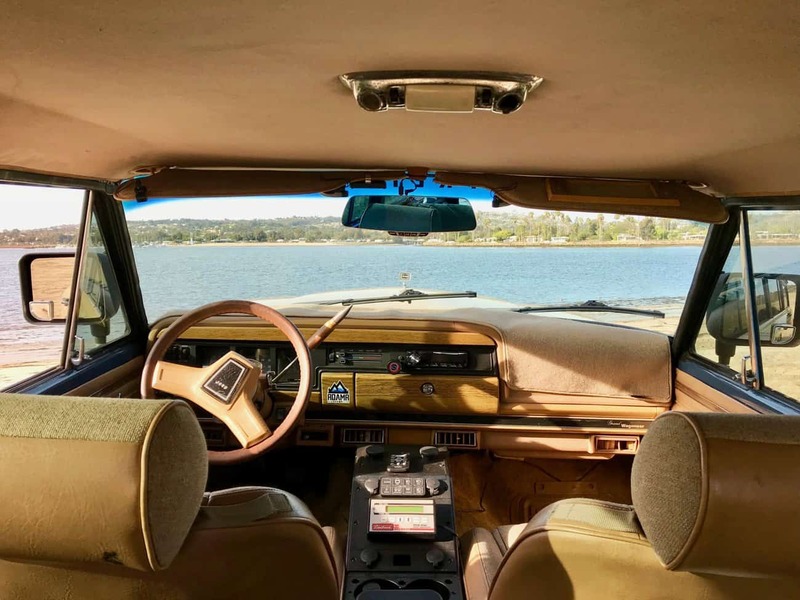 Although it certainly looks new on the outside, this Wagoneer is still running on an AMC 360 cubic-inch V8. That motor is mated to a Torque-Flite 727 3-speed transmission, a Selec-Trac NP229 transfer case, and also features Doug Thorley Headers and a custom exhaust for better sound and performance. We’re not sure what sort of fuel economy this truck is getting, but we’d bet it’s quite thirsty. 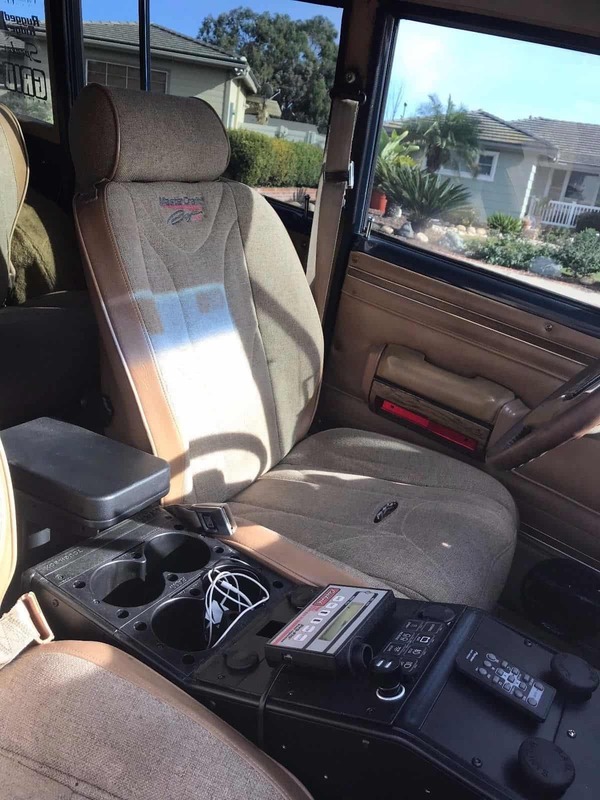 The seller is currently listing this vehicle for $39,000 USD on Expedition Portal, but it’s listed on Ebay for a buy it now price of $37,000. To learn more or contact the seller, visit the original for sale ad on the forums here.